This is a continuation of my previous post, How I Grew My Paypal Account from $40 to $400 in 24 Hours. And to recap what I shared previously, in August of 2015, I partnered with Dave Lynch to launch an information product for the MMO Kindle niche. Dave had the idea for the main front end (FE) product. It is about an underutilized online platform where authors can setup a free giveaway and collect an email address in exchange. This is an ideal way for authors to begin building a list, a topic which is not pleasant for most authors, who tend to be on the tech-shy side. When I looked over Dave’s rough draft, it occurred to me that a good accompaniment (upsell) would be a guide on using MailChimp, which is the free email provider Dave recommends. This was a good idea and a not-so-good idea. A better option would have been to frame the first upsell in another way, and throw in MailChimp email training as a bonus. Your upsell should be something that is a natural up-leveling of your main product. It’s something that will get results for your customer faster, cheaper or better. It might be a done-for-you service that gets your customer faster results. It might be a mini-coaching program. It might be a software option. In our case, I suggested an upsell around MailChimp and Dave agreed. He said he could have it written in a week. I was sold. My husband came up with the product name, “Chimp Charmer.” Now all we needed was a second one-time-offer and we’d be good to go. 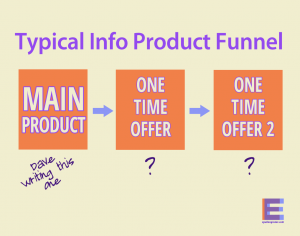 A second one time offer (OTO) is not difficult to add in to your funnel. If you can find one that piques your customers’ interest, and satisfies a desire, you can easily add some dollars to your launch. In our case, we were short on time. I located a PLR product on my hard drive that was centered around email marketing. I actually only had Resell Rights to the product. But it was nicely packaged, had three great bonuses with it, along with a salespage already done. I was SOLD! “Email Copy That Sells” became our second one-time-offer. By the end of the second week of our collaboration, our product launch was really taking shape. “What’s your budget?” he asked. I didn’t want to tell him we didn’t have one, lest it appear unprofessional. So I said, “$25,” wondering how professional that low of an amount sounded. “No problem!” I said and “Hooray” under my breath. That task was delegated. Within 3 or 4 days we had a GORGEOUS product cover. Dave and I were psyched! I decided we could raise our initial offering price from $8.95 to $12.95, just because of the cover. I posted the cover image and launch info in one of the main MMO Kindle groups and we began getting requests for review copies. I say, “Final” but I would change one of the prices once more before our final launch. Check back for our next post to find out what changed. Or, you can sign up, and have it delivered automatically to your inbox next week. Barbara, thanks for sharing your journey with us. I am looking forward to seeing your progress. Would you mind posting in the future about your Kindle experiences, and a little about how it works? Roy Miller recently posted…A Blueprint…Why Do I Need One? Absolutely, Roy! Thank you for asking. LOL Seems like I ought to have something about “epubs” and publishing, doesn’t it? Thanks for the tips. Although not now, they will come in handy very soon! I’m currently busy with the planning of my first ever digital product. The tips and errors mentioned in this post are priceless ‘just like mastercard’. I don’t think one realises the importance of the ‘value’ one’s OTO should present to the buyer. We tend to think about what we’d like to offer, not what is necessarily useful in helping the buyer fast-track their goals. This a great insight into some of the different things that can happen. I have found Fiverr to be a great source of decent covers and many other things besides. If you have a slight artistic inclination yourself then Canva can help you too. I have a nice piece of software that can turn 2D images into box shots, but again there are places online that can do that for you too and are well worth investigating. I’ve got to do a story telling post like this as I think it becomes a valuable insight for other people as well as a nice memento for yourself in later times. Well done Barbara for putting together this product funnel. Must be an exciting experience.